Monika Balog: I am a Baroness of Romani People; I am always with my people! — Правозахисний фонд "Розвиток" | www.rozvitok.org Monika Balog: I am a Baroness of Romani People; I am Always With my People! Monika Balog: I am a Baroness of Romani People; I am Always With my People! Do you know that the elder of the Roma can be not only a man? Current transformation processes, including the spread of democratic values occur in all spheres of human life, and penetrate the seemingly conservative bases of the traditional system, which seems to never be broken. It happened in the Roma camp, which is located in Transcarpathia. 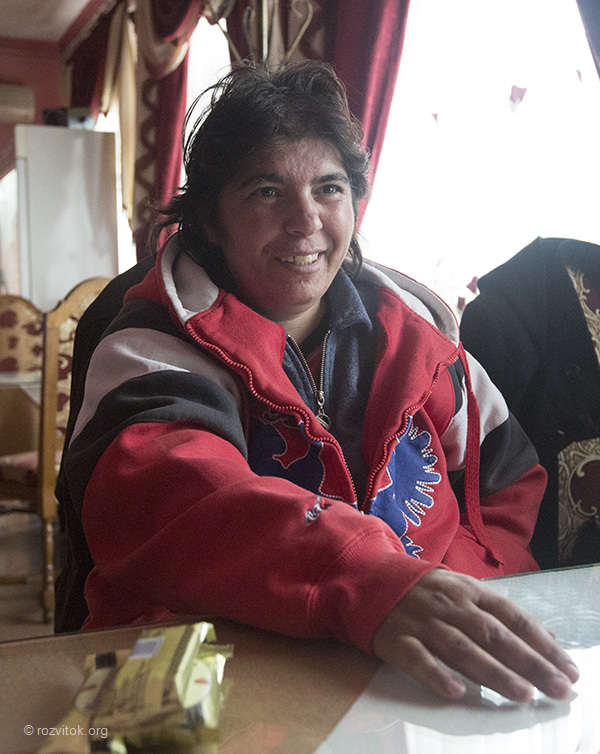 Ilona Balog, better known as Monica, is the first baroness in the Roma camp in Chop. How long is your life connected with the Roma camp in Chop? For 43 years, I have lived in the camp in Chop. History of it goes back more than a hundred years. Here my ancestors lived, here I was born. I graduated from the Hungarian school, which is in Chop. After school, I had to go to work, because my mother was ill. Already working, I married and gave birth to my only son. And now I have two wonderful grandchildren. Everybody knows me as Monica, although by documents I am Ilona. There was an interesting story from my childhood, when my relatives quarreled a bit about my name. Preference took the Ilona name, but my brother said I would be Monica. So now I am Monica. Baroness is unique phenomenon. Tell me how you became an elder of the Roma settlement? Frankly speaking, it was a surprise for me. I know that I have the support, because I have the authority. However, I remember, that the woman never was an elder. This happened three years ago. In our camp, there were two barons before me. And, of course, they were men. I acted more as an activist. From 2013, I am a member of the public organization “People’s Control” in the ranks of which we made many important things. But I knew that if I were elected by democratic elections, then I could do much more for the camp. It’s not so necessary to explain, that is our Roma system in general, and the institute of Barons / Baroness is respected. So, you decided to go for elections? Well, frankly speaking, I never felt a lack of determination. I know what I want to do for my community, and I know that they support me. There were three candidates on election. I won by the majority. So, for 3 years, I have been a Baroness. It is interesting that my birthday coincides with the date when the previous Baron was born. In the community, they said laughing that this mystic. As far as we know, Chop camp is great and scattered around the city. 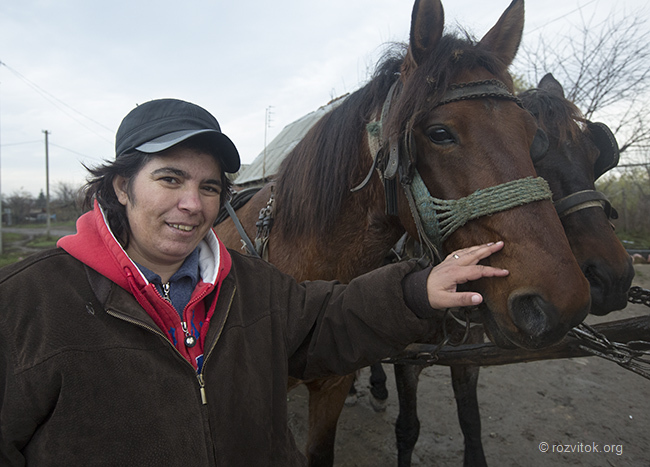 How do you help all Roma people in your location? Yes, it is true that there are many Roma in camps in Chop. I live in one of its parts. I can say that in this part there are the biggest problems. Roma do not seek help often. And there are a number of reasons. First, that when they ask for help, they get refusals. Roma try to solve their problems by themselves. However, when the issue cannot be solved – they apply to me. I have always been among people, so it’s not so hard to find me. What are the problems, which are faced by the most Roma? Basically, these questions are about obtaining passports, certificates of birth, privatization of property and social assistance. Other, well-known problems within the scope of municipal housing issues, we try to solve together. I will tell you about a situation, when we defended our rights. After the next election of Galina Tsar as the Mayor of Chop, the Roma problem, unfortunately, continued unresolved. We are often applied with requests to make the road in camp. You see, it’s not because we do not like to walk on the dirt. This is a significant problem for us. As soon as it rains, all the dirt poures into our homes. Kids have to live in the unsanitary conditions. They even cannot get in school, because the bus doesn’t want to drive on the road like that. Yes, before there were cases when the bus driver just did not stop and start shouting on children that he never drives the dirt. And here is already a good reason – it is impossible to stop. Our activists collected in buckets with dirt from the road, and took it all together in the town hall. On the way they were stopped, and not allowed to go in the town hall. However, they came and put these buckets at the office of the former mayor. Impressive! In modern words, you have made an advocacy campaign to protect yours rights. What was the reaction? Certainly no one expected such an act from Roma. All got accustomed that we are the ghosts who do not need anything. And here we appeared to defend our rights. Well, what about reaction. Again, we got the promise that in the summer we will have a new road. However, it did not happen. Now, we elected a new Mayor, and we believe that our problems will be, if not solved, at least at the agenda. Definitely, we have to make a lot of work. But part of the road have already been done. And, yes, it’s not my merit. That’s all we’re doing together. Does the female management style differ from masculine one? I will not answer “yes” or “no.” I just tell you about my style of work. Everyone knows me as a simple person, who is always among people. For me, my community is my big family where we can discuss everything. I never put myself a step above, just because I am Baroness. I know everyone in the face, by name, and by problem. And I feel the support of my community for it. Of course, on occasion, I will wear a dress, and will show off. But this is not the whole time and it’s not so necessary. We have so many chiefs and so-called elite. Even if I become the President, I will continue to wear simple and comfortable clothes, I will argue with all public officials for my community. Sometimes, unfortunately, you cannot achieve something without the screaming or conflict. I teach my Roma this, that sometimes you need to be stronger than you really are. I feel the notes in your words that remind me things relating to Anti-Roma actions. Is it so? Unfortunately, yes. 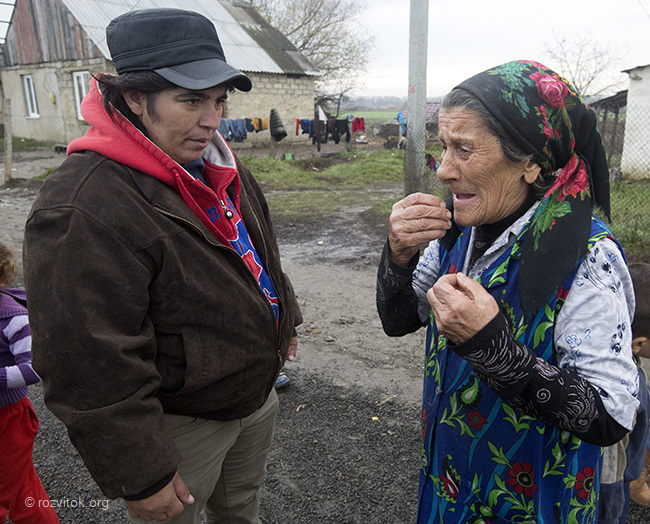 Discrimination against Roma is occurring every day and at every opportunity. You do not need to go far. I will tell you my story. Just last week, I asked the question about the receiving of social assistance. I got an official letter, which stated that I did not provide a full documentation pack. But I did it. So, I had to go to the department of social security, where I faced a stream of verbal abuse. Unfortunately, I was sick and had a temperature. But next week I will go to appeal. I will not stoop to the level of verbal abuse and threats. I will work in the legal field, because the truth is on my side. It is terrible, what happens. What about the Roma children? Do they feel discrimination at school? We haven’t school in our camp. I am delighted with this. If somebody builds another segregated school similar to the Roma School in Mukachevo, we will isolate our children from a different vision of life. So, our children visit the Hungarian school in the city. All kids go to school, and there they are not faced with discrimination. Another question, if they want to go in Ukrainian or Russian schools. There, they will fell all colors of it. What are your plans for the sustainable development of the Roma community? At present, all issues are a priority. In fact, it is difficult to identify the most important. So far, the road is more or less done. We will return to this question in spring. My priority is the question of gas supply. Roma use the old stoves with wood or expensive gas cylinders. I have found craftsmen who are willing to help us in carrying gas. Roma are ready to set the counter and pay for what they use. Issues of water supply are also painful. But they are easier to solve. The fact is that in Soviet times, the water supply was installed. However, in the independent Ukraine, the pipe on which the water came to us was “cut off”. Now, we have to walk in the houses, where the pumps are and get water. But the question is a small – to help to restore a pipe. However, I am confident that it is possible to do everything if you want. And such a desire exists in the Roma community. PS: The centers of legal information and advice that provide free legal aid to Roma people working with the support of the “Roma of Ukraine“, International “Renaissance” Foundation. To learn more about the activities of a network of centers, foundations and principles of work visit the website www.legalspace.org under “Legal Empowerment of Roma communities.” The views in this article are those of the authors and do not necessarily reflect the opinion of the International “Renaissance” Foundation and other civil, religious and political organizations and individuals.